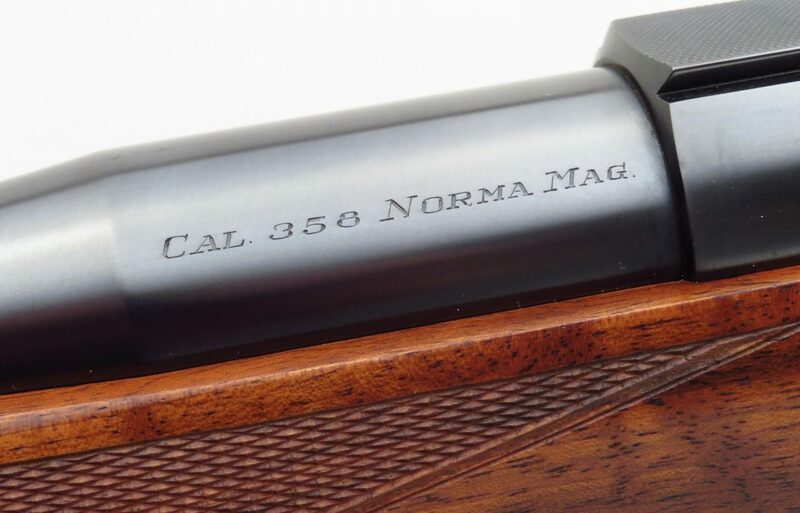 Griffin & Howe .358 Norma Magnum, Kaye game scene engraved, Churchill checkered, factory history letter - Sportsman's Legacy, Fine firearms, related books and sporting collectibles. Representing estates, collectors and nonprofit conservation organizations. Griffin & Howe custom .358 Norma Magnum on a Sako action masterfully game-scene engraved by Tommy Kaye and checkered by Winston Churchill. Based on a Sako L61R action and marked “No. 2589 Griffin & Howe New York, NY”, the serial number is 52882. 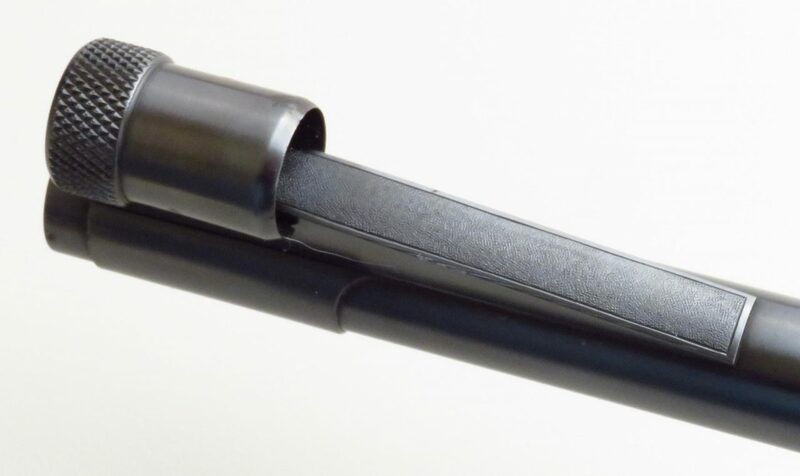 The 24-inch barrel has a banded and hooded front sight, a banded sling swivel stud and is not tapped for a rear sight. The action has a jeweled bolt body, extractor and follower, along with a carefully tuned trigger. 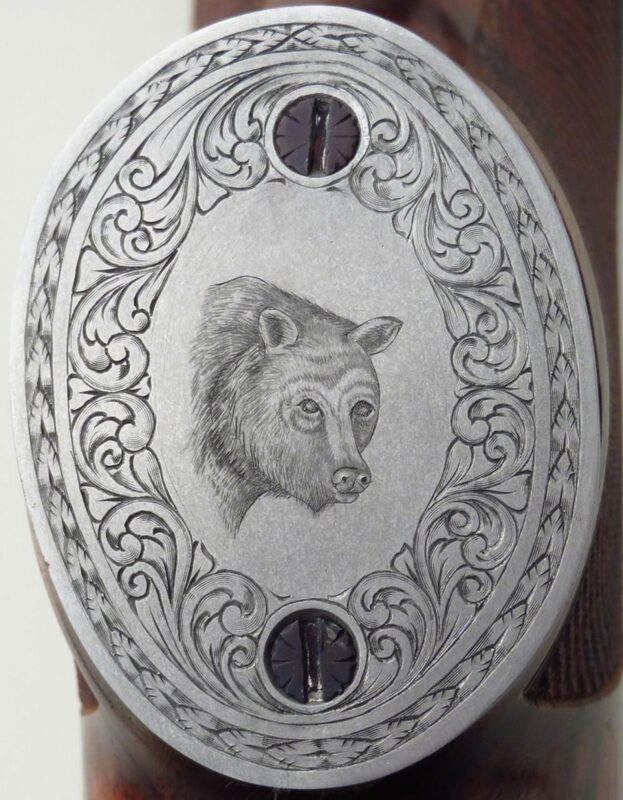 The floorplate engraving is spectacular, with a glaring Alaska moose in profile among elegant scroll, a theme which continues over the trigger guard and then circles a grizzly bust on the grip cap. Bottom metal and the grip cap are finished in French gray as an accent. 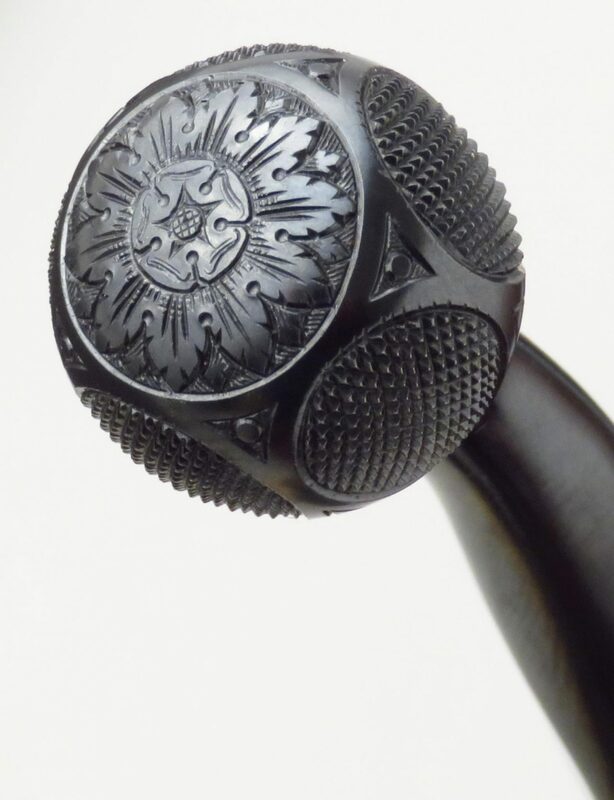 The bolt knob is checkered in a five-panel teardrop pattern and finishes in a stunning circular tapestry. The single crossbolt features a complimentary pattern and all of the attaching screws are finished in niter blue. The stock is fashioned from a rich walnut blank shot through with fiddle and superbly checkered in a 24 lines-per-inch bordered wrap-around pattern. The shadowline cheekpiece is carefully scalloped as well, an ideal compliment to the classic straight comb (both drops are 1.25 inches) shape. Weight is 8.4 pounds and length of pull is 14.25 inches. Metal finish (rust blue on barreled action and French gray along the bottom) is at least 98% due to minor scaling. Wood is at least 97% with scattered evidence of field use (mostly light impressions). Completed in 1975/76 and supported by a factory letter.